We love to do engagement photo shoots (sometimes also known as pre-wedding photo shoots). These are a fantastic time to become accustomed to being photographed if you are a little nervous or unsure about being photographed, and let's face it who isn't! We get to find out a little more about you and your like and dislikes during the session, we will also do our best to help you feel relaxed with a photographer around. 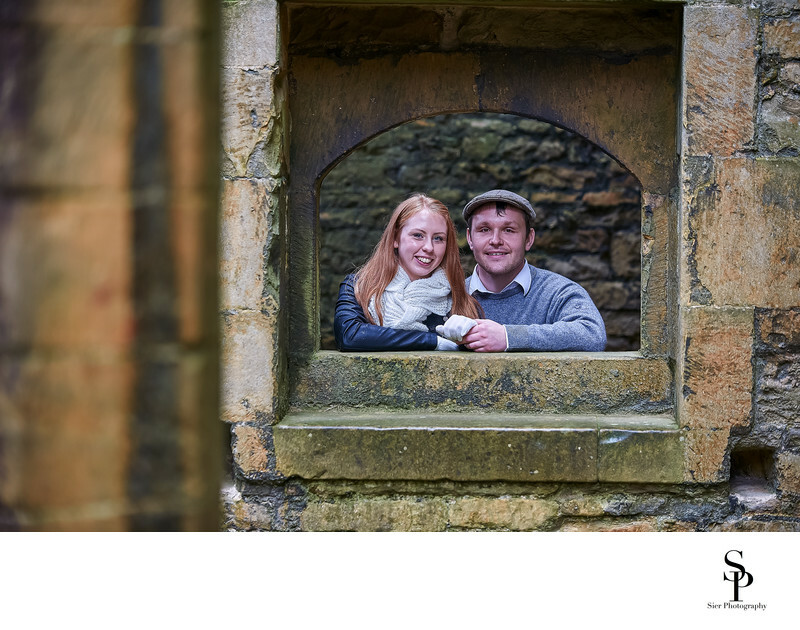 In this image from an engagement shoot at the magnificent ruins of Bolsover Castle in Derbyshire. We used the old stone window frame left in the wall of the ruins makes a wonderful frame to frame our couple in this image. We had never visited Bolsover Castle before this and were absolutely blown away by all that this stunning English Heritage site has to offer. We spent a good couple of hours exploring the whole site with our happy couple and made hundreds of images for them to keep forever. That is some ways is the point of wedding photography, it is not about the here and now but is about the future, not just yours but for your children, grandchildren and beyond to look back on with fondness and happy memories.